Within the fruitful research environment of the Institute for Computer Graphics and Vision, the focus of our research is the development of mathematical models for computer vision and image processing in mobile scenarios as well as the development of efficient algorithms to compute these models. Our group consists currently of 5 PhD students and 2 PostDocs. 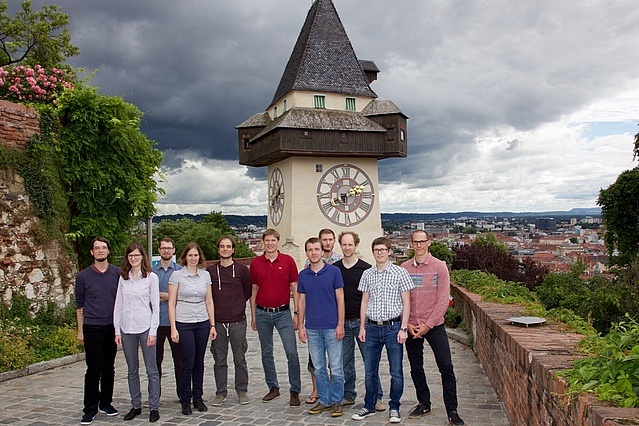 Find out more about our research, our team and published software! Oct 5th: Our article is accepted in Magnetic Resonance in Medicine (MRM)! Sept 15th: We have been awarded with the Best Paper Award for Variational Networks: Connecting Variational Methods and Deep Learning and a Honorable Mention for Scalable Full Flow with Learned Binary Descriptors at GCPR 2017 in Basel, Switzerland! Jul 17th: Our paper Volumetric Flow Estimation for Incompressible Fluids using the Stationary Stokes Equations has been accepted to ICCV 2017 in Venice, Italy! Jul 4th: Our paper Semantic 3D Reconstruction with Finite Element Bases has been accepted to BMVC 2017 in London, UK! Jun 16th: Our papers Scalable Full Flow with Learned Binary Descriptors, A Primal Dual Network for Low-Level Vision Problems, Variational Networks: Connecting Variational Methods and Deep Learning, Trainable Regularization for Multi-frame Superresolution have been accepted to GCPR 2017 in Basel, Switzerland! Mar 7th: Our paper Real-Time Panoramic Tracking for Event Cameras has been accepted to ICCP 2017. Code can be found here. Feb 28th: Our paper End-to-End Training of Hybrid CNN-CRF Models for Stereo has been accepted to CVPR 2017. Code can be found here. Oct 4th: New student projects and thesis topics online! Aug 16th: BMS Summer School: Lecture Notes of Thomas Pock can be downloaded here. Jul 27th: New software online! Large-Scale Semantic 3D Reconstruction: An Adaptive Multi-Resolution Model for Multi-Class Volumetric Labeling. Convolutional Networks for Shape From Light Field.